This postcard from PostSecret reminded me how hard eating disorders can be. 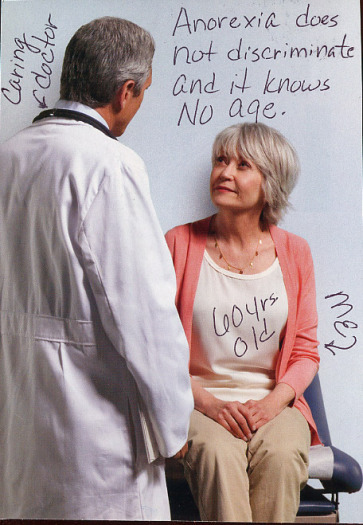 Anorexia does not discriminate and it knows no age. People assume that anorexia is a young person’s disease because that’s all we see in the media, but it can hit people at any age. The same is true with bulimia, binge-eating and exercise bulimia. You’re not “safe” once you hit a milestone in your age. You’re not even “safe” if you used to suffer from an eating disorder and have been in recovery for many years. In fact, when you have a relapse, it usually hits you HARDER and STRONGER the second time. If you have been recovered and you fall back into your eating disorder, it will be that much harder to get back out. Your brain is pre-disposed to being addicted to these behaviors, so if you give it that crazy hit of dopamine again, then you are playing with fire. I HATE the fact that I will never be free from binge-eating. I haven’t had a binge for over seven months, but I am not safe. I will never be safe and every day, I need to meditate and get my “hit” of those brain chemicals that are released when I have a spiritual experience in order to hold off the eating.